Crooked teeth are no fun. They can cause you to hold back from showing off your smile when you’re taking selfies with your besties. Plus, they can make it difficult to achieve a truly clean mouth when you’re brushing and flossing. 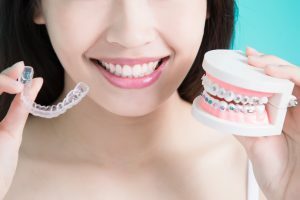 You could look into the possibility of getting traditional metal braces, but many people have opted for Invisalign in Marysville instead. What are the major differences between these clear braces and their metallic counterparts? With traditional metal braces, your orthodontist fits the wires and brackets in your mouth. Every six to eight weeks, you have an appointment to get the braces tightened. Gradually, your teeth get repositioned to where they need to be. If you opt for Invisalign, your certified provider will design a series of thermoplastic aligners for you. You’ll wear the aligners for 20 – 22 hours each day. Every few weeks, you’ll switch to a new aligner, and your teeth will get closer and closer to perfection. You’ll have periodic appointments with your dentist in Marysville so you can be sure that your treatment stays on track. Another advantage with Invisalign is that you’ll be able to see a digital representation of your new smile before the treatment process starts. You’ll have something to look forward to! When you think of braces, you probably think about a teenager with a mouth full of metal. It’s really not an attractive look, especially if you’re an adult who wants to project a professional image. Invisalign is clear, so it’s unlikely that other people will even notice that you’re wearing them. You won’t be in danger of looking and feeling like you’ve gone back in time to those awkward high school years. Metal braces have brackets and wires that can irritate your mouth. Furthermore, they restrict you from eating certain foods that might get stuck in the braces. It can also be time-consuming and difficult to keep your teeth clean while you have braces. Invisalign is much more convenient. The aligners are removable, which means you can eat and drink without worrying about damaging your teeth or your braces. You’ll be able to brush and floss according to your normal routine. Exactly how long your braces will take to give you the smile of your dreams depends on how far your teeth need to move. On average, though, you can expect metal braces to take two years to provide final results. Invisalign is usually quicker; for adults, the process can take anywhere from 10 to 18 months if you’re diligent about wearing your aligners the recommended amount. Invisalign offers many advantages over traditional metal braces. Your local dental professional can help you determine what the best method is for you to achieve a gorgeous, straight smile. Doctors David Cleveland, Deric Burdendorf, and Kyle Wylde are proud to provide a comprehensive range of dental services to folks in the Marysville area. If you are interested in Invisalign or other oral health treatments, contact our office via our website or by phone at 937-644-8822.